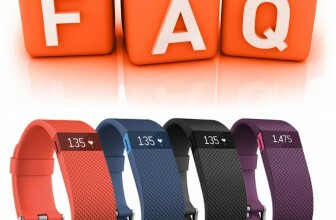 Fitbit or Jawbone – what activity tracker should you be rocking in the new year? 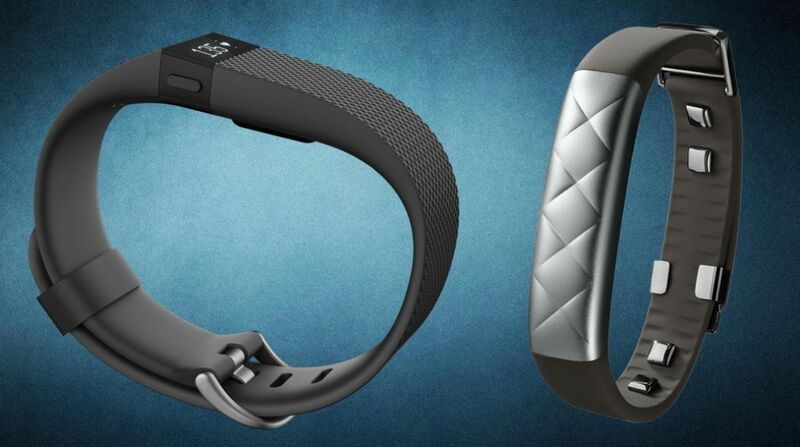 Jawbone versus Fitbit has been the big battle of the fitness tracker genre since time began – or at least since 2011 when the original UP and the Fitbit Ultra both went on sale. 2015 sees the rivalry escalate with the launches of the Jawbone UP3 vs Fitbit Charge HR – a duo of new flagship activity bands vying for your wrist-space – and both of which are now finally available. 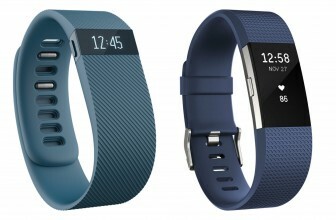 The Fitbit Charge HR looks a lot like its non HR labelled brethren – the Fitbit Charge. It is made from a flexible, durable elastomer and features a surgical-grade stainless steel buckle. There are three different sizes available with wrists from 5.5 inches up to 9.1 inches catered for. The Charge HR is 34mm wide, so is a fair bit meatier than the 12.2mm thickness of the UP3. With Fitbit’s tracker you have a choice of black, plumb, blue and tangerine and, like the discontinued Fitbit Force, it has a small OLED display to show the time, stats and incoming caller IDs. There are no other smartphone notifications – you’ll need to upgrade to the Fitbit Surge to get those – but it certainly beats its Jawbone rival in this area. Overall, in our Fitbit Charge HR review we enjoyed wearing the fitness band – it’s discreet, unisex, comfortable even when sleeping and the only potential problem is skin irritation – some users suffer from it, some don’t. The UP3 only comes in one size but there’s an adjustable clasp so in theory should fit any wrist size. This is actually really awkward in use, though, and we prefer Fitbit’s more secure buckle. The UP3 originally hit the shops in two designs – black diamond and silver cross – although multiple colours and patterns are expected soon after. There’s no OLED display here but there is a trio of lights to indicate sleep, activity and notifications. Blue lights are used in sleep mode, orange is for activity, and white lights tell you about notifications. It’s Jawbone’s thinnest and lightest tracker so far which really makes a difference and we didn’t experience any irritation issues. Design and fit is a really personal choice – both of these trackers are comfortable and will look good with a range of outfits – from gym clothes to officewear. Both are also splashproof, not waterproof. The UP3 was just a bit too fiddly for us so the Fitbit just about wins this round. The Charge HR has 24/7 heart-rate monitoring on offer, using the company’s new PurePulse technology. It’s the same sensor you’ll find packed into the Fitbit Surge ‘super watch’ that’s due to hit the shops around the same time. Fitbit states that the constant bpm recording results in a more accurate calorie burn figure and that it allows users to train in different intensity zones using their heart rate peaks. Take a look at our guide to heart rate training to find out more.We tested the Fitbit’s heart rate monitoring versus a gym machine for our review and found it to be spot on but look out for much more detailed testing of Fitbit’s tech coming to Wareable very soon. 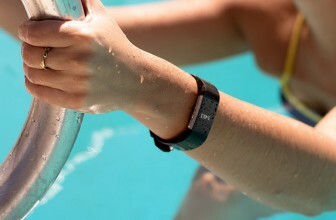 The Jawbone UP3 is built on an advanced multi-sensor platform that includes a newly designed tri-axis accelerometer, bioimpedance sensors, as well as skin and ambient temperature sensors. The new band uses this sensor setup to provide wearers a resting heart rate, which is a crucial indicator of your overall heart health and the company is touting its new device as “the most advanced activity tracker known to man”. As we noted in our Jawbone UP3 review, we felt disappointed by the fact that we could only track resting heart rate. You get just one reading a day, when you wake up, and there’s no continuous tracking during runs or workouts or even the ability to manually take a reading. In terms of the resting rate measurements, they also seemed a little on the low side (by 5-10 bpm) when compared to a manual reading on a Mio Fuse. Neither the Fitbit or Jawbone offers a perfect heart rate tracking system but on balance, the Charge HR is much more useful. Both of these bands will track your everyday activities such as steps taken, distance travelled, calories burned, floors climbed and active minutes. 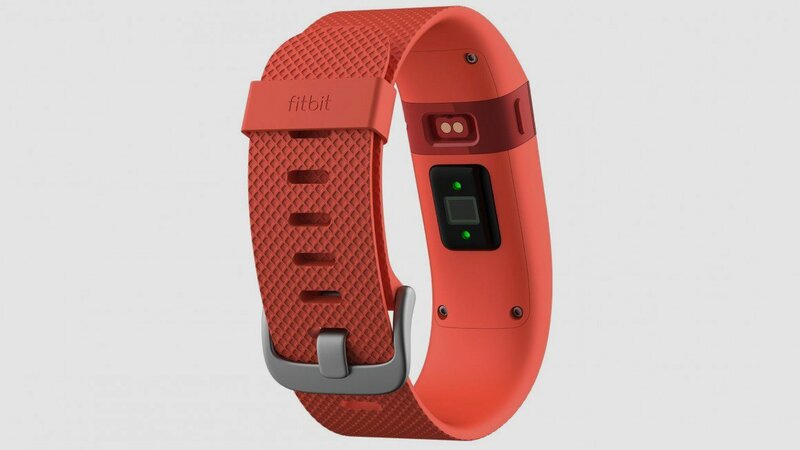 Neither the Jawbone nor the Fitbit pack GPS tracking as per the Microsoft Band or the HTC Grip, which is a real shame for runners. The Charge HR’s OLED display will give you your stats in real-time using the Exercise Mode and the Fitbit app lets you see progress, record workouts, share and compete with your friends, log your food intake and earn badges based on your activity. Generally your step count will probably be slightly higher on the Fitbit than the Jawbone but both are at least consistent which is useful for setting and sticking to goals. The Jawbone UP3 nudges you when you’ve been idle too long and has automatic sport detection skills, which did eventually kick in after a couple of weeks of using it. The new UP3 app ties in the new Smart Coach system – a real-time information system that analyses the data that the UP3 band records about you to provide personal advice on your goals and objectives. In theory, the more you use your UP3, the better the Smart Coach will understand you. In reality, this feature needs a lot more work. There’s also sleep monitoring on offer with both trackers. 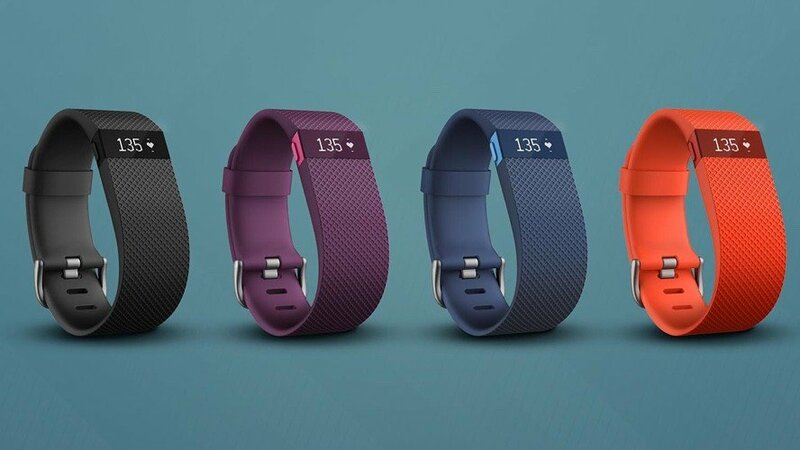 With the Fitbit Charge HR sleep tracking kicks in automatically, and there’s a vibration-based silent alarm as well. 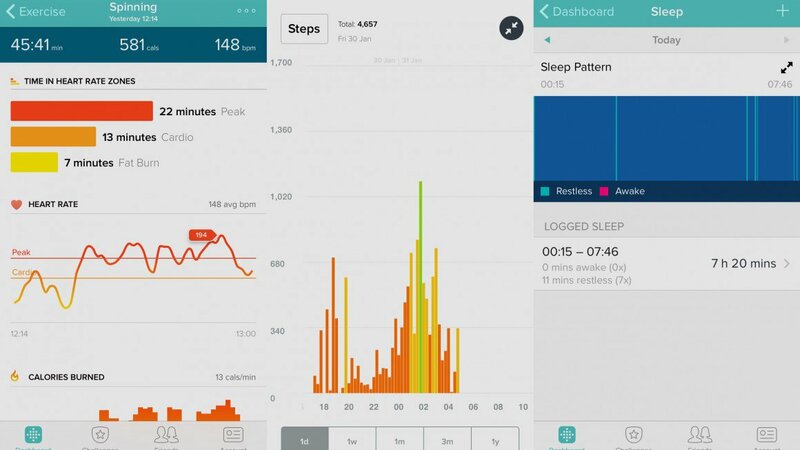 Fitbit simply tracks how many hours sleep you get, that’s it – it’s very simple and if sleep tracking is a big reason for you buying a health and fitness wearable, perhaps a Withings Activité might be more suitable. Here there’s no stats on light or deep sleep to pore over. Things are a little different on the Jawbone UP3 which tries to do a whole lot more but ends up in a bit of a jam. 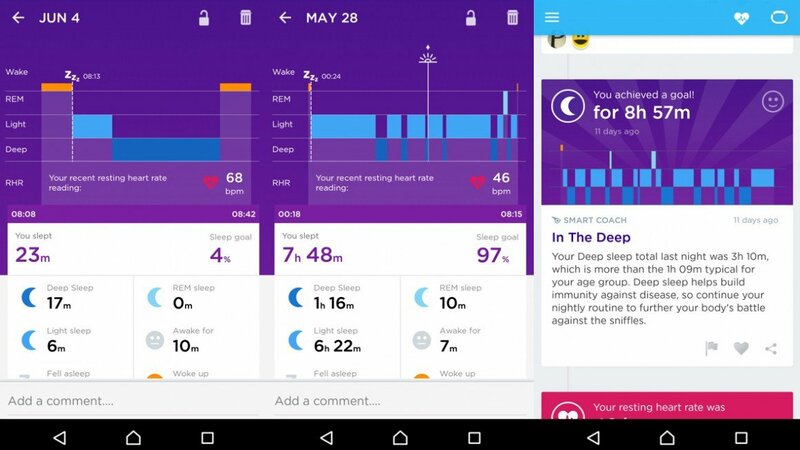 Not only does the UP3 claim to differentiate between REM, light and deep sleep, the Jawbone app should also provide information and analysis on your kip to help you improve it. Sadly during our time producing our review of the UP3, it didn’t even always get the sleep times accurate. In total it was about even but it didn’t recognise us getting up in the night, for instance.Sleep tracking is set manually on the UP3 but for nights that you don’t remember, it will make an estimate based on periods of inactivity. There’s also a smart alarm function which gives you a 30 minute window to wake up during lighter sleep. Which tracker is best for you in terms of activity and sleep tracking really does depend on what you want to get out of it. That said, it’s tricky not to be disappointing when using the UP3 considering the hype that preceded it. The Fitbit Charge HR is £119.99 in the UK, $149.95 Stateside. The battery life of five days is manageable and it’s easy to charge via the proprietary cable – just don’t lose it. The Jawbone UP3 is the slightly more expensive device at £129.99 in the UK and $179.99 across the pond. The battery life is up to seven days, which we found to be fair, but the short charging cable is badly designed and awkward to use with a laptop. Both flagship trackers claim to be the most comprehensive wearable fitness device yet. What is clear is that both the Charge HR and UP3 are vastly superior to their predecessors. It’s also apparent that both Fitbit and Jawbone want their existing device users to upgrade to the new models with the updated apps offering a wealth of extra info and features while at the same time staying loyal to the current communities. Either way, you’ll be getting a top-end activity tracker but the Fitbit Charge HR does score slightly higher than the Jawbone UP3 on our individual reviews with 7/10 over the Jawbone’s 6/10. That’s because the Fitbit is cheaper, offers 24/7 heart rate tracking, incoming call alerts on the OLED screen and reliable, if simplistic, sleep tracking. 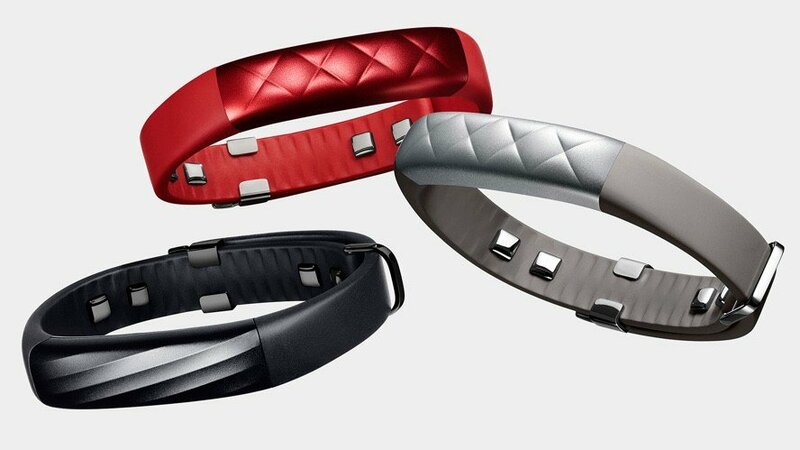 We love the Jawbone app, that seven day battery life is great and some people will prefer the design. It’s close but the Fitbit is the best all-rounder. Let us know if you’re using an UP3 or a Charge HR using the comments below. 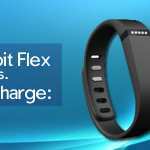 Activity Trackers Review: The Fitbit Flex Vs Fitbit Charge - Is Newer Really Better?